We were woken up around 5am today by what we thought were elephant calls from two elephants. One was calling from one side of the camp, the other was calling from the other. Turns out that two lions were hunting in our camp, and those were roars. Everyone was still here when we finally did get up, so I guess the hunt was not successful. The camp is a series of tent bungalows that overlook a large grassy plain. As I type this, there are groups of zebras, impalas, waterbuck, vervet monkeys, and a couple elephants wandering around, all within maybe 1000 feet of me. And maybe the two lions from this morning. I had an important learning today. I noticed a couple of related things. First, there are a lot of tsetse flies around. These aren’t your garden variety houseflies. No sir. These not-so-little winged devils bite! The second thing I noticed were all these black and blue flags hanging from trees. Here’s an example of one (the normally black stripes are more of a grey here). 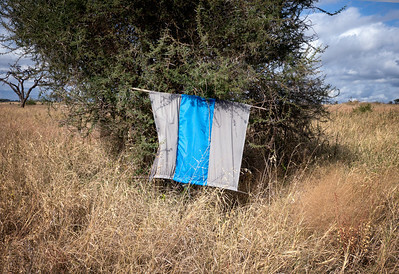 It turns out that tsetse flies are attracted to the colors blue and black. These flags are coated with insecticide and serve to reduce the population of the winged monsters. Now, learning is power and all that, but it’s only powerful if it happens at the right time. The right time for this particular learning for me would have been a week ago, while I was packing for this trip. For, you see, the vast majority of my clothes are either blue or black. I’m a walking tsetse fly attractor! Now I understand why people dress in khaki while on safari (we thought everyone was just posing as Master Safari Expeditioneers(TM)). We did one long game drive today. We left around 9am and returned around 3pm. This is different from what we were used to in South Africa and Botswana. There, we’d do two game drives, one in the morning from about 6:30am to 10:30am and one in the afternoon from about 4pm to 7pm. Our camp in Tarangire is currently surrounded by high grass, and it takes about an hour of driving to get to the areas where we can see game. So it makes sense to do one longer drive instead of two shorter drives. There are a lot of monkeys around here, but it can be difficult to photograph them. They tend to scurry around. 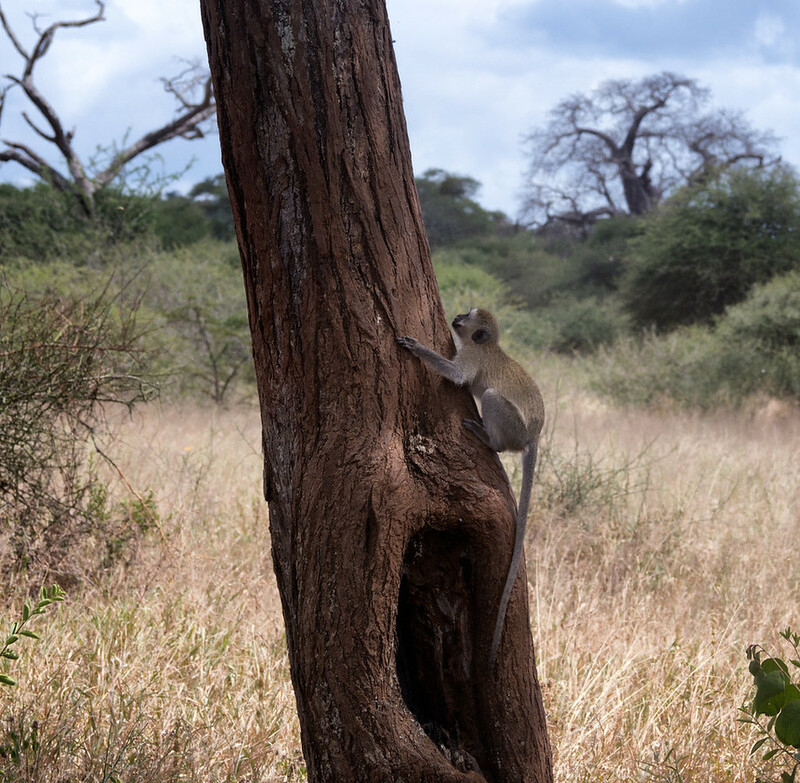 Here’s a Vervet that I managed to catch in the process of climbing a tree. 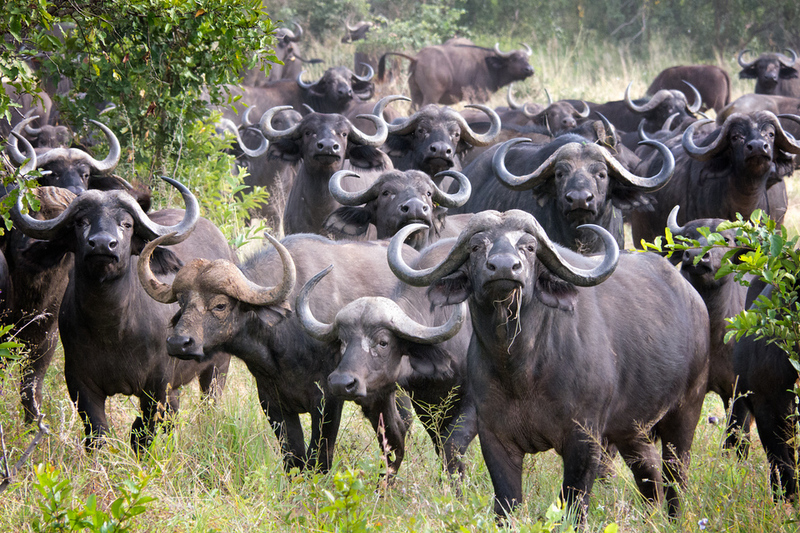 Cape Buffalo are another animal found in large quantities in Tarangire. We came across a herd of them in the morning mist. 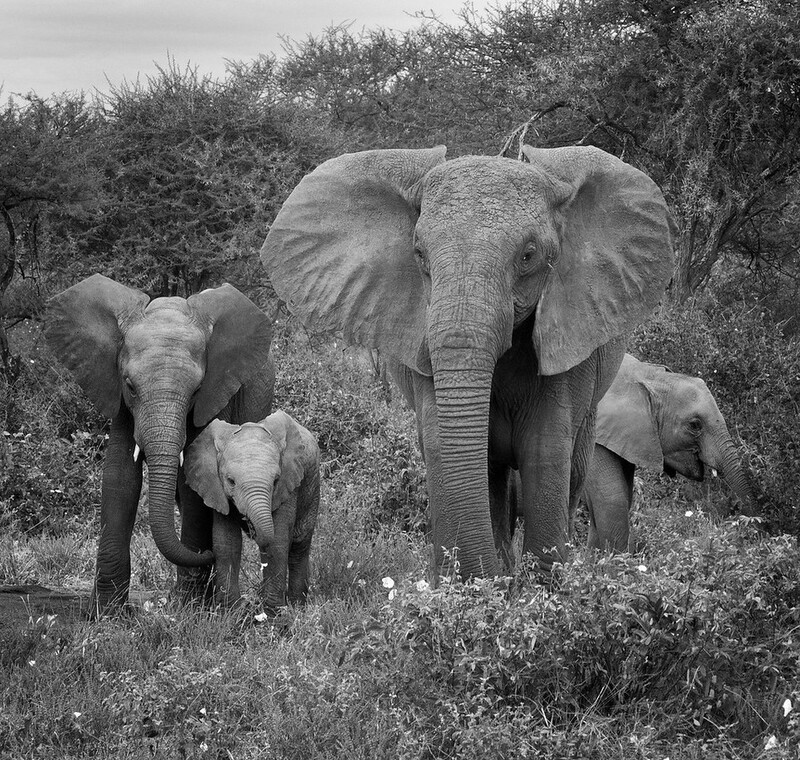 And of course a post about Tarangire wouldn’t be complete without an elephant photo. Hi Mark, with your permission I’ld like to link from my blog to the tsete flag picture you have here. Great reading by the way, especially your learning moment with the colors. We had the same, except that I hung out our sleeping bags (really BIG flags) to get them aired. (we did a self drive for three weeks, ao. Tarangire).